BANGI, 20 Dec 2012 -Syrian women and children were raped in front of their husbands and fathers with some of the despicable acts even committed in mosques. People were slaughtered on a daily basis with some of them mutilated by President Bashir Al Assad’s regime. 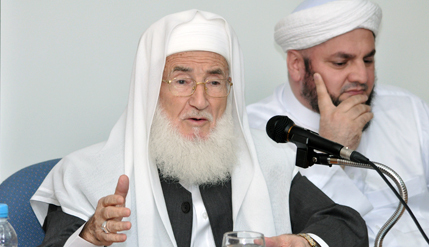 Despite such atrocities they did not receive the help and media attention that they deserved, said Chairman of the Syrian Ulama Council, Sheikh Muhammad Ali Al Sabuni. The 83 old renowned Islamic scholar came to The National University of Malaysia (UKM) to seek help from Malaysians in whatever way such assistance could be rendered. Making his emotional plea in Arabic, he said the atrocities committed on the Syrian people are much worse than those committed by Israel on the Palestinians judging from the death toll. Syeikh Muhammad Ali said 60,000 Palestinians were martyred in 60 years but over the last two years of intense oppression in Syria, 60,000 people were killed brutally. That is the official figure whereas the unreported death is 5 times more, he said. The problem is that the Syrian plight is overshadowed by the Palestinian cause. Muslims don’t see helping the Syrian is as important as helping the Palestinian. The Syrian people do not just need money and prayers, they need every Muslim whether in Malaysia, Saudi Arabia or Indonesia to be united about the importance of helping Syrian. The situation in Syria is not a conflict between the Sunnis and the Syiahs because to call what is happening in Syria a conflict is to suggest two parties of equal strengths. But the actual situation is where the defenseless ordinary people are being massacred because they are Sunnis. Syeikh Muhammad Ali said not even one mosque in Syria is not damaged or destroyed by the regime, which is supported by Iran. He said no hospital would be willing to help the Sunnis; if they are injured or maimed they are left in pain until they die as even family members can’t help because those who helped will be tracked down and killed. Thus the injured who needs urgent medical attention is left untreated, the best they could hope for is for the injured to die quickly. Syeikh Muhammad Ali’s statement that Syria is as important if not more so than Palestine was emotionally objected to by a Palestinian saying that would be tantamount to taking away help and attention from Palestine. But her comments was responded by Abu Anas, another member in the audience, a Palestinian Medical Doctor who have worked on the frontlines in Gaza. They have no food and children freeze to death because there is no heating, no medical help and hunted and slaughtered like animals. He agrees with Syeikh Muhammad Ali that right now, the situation in Syria is much worse than in Palestine. Syeikh Muhammad Ali clarified that he was not asking Muslims wanting to help to make a choice but was only trying to correct the misconceptions among Muslims that Syrian oppression is not bad. The talk organised by the Institute of West Asian Studies was attended by more than 200 students and lecturers.